[143 Pages Report] The FPGA market was valued at USD 5.34 Billion in 2016 and is expected to be valued at 9.50 Billion in 2023 to grow at a CAGR of 8.5% between 2017 and 2023. The growing demand for advanced driver-assistance systems (ADAS), the growth of IoT and reduction in time-to-market are the key driving factors for the market. The base year considered for the study is 2016 and the forecast period considered is between 2017 and 2023. The objective of the report is to provide a detailed analysis of the FPGA market on the basis of technology, configuration, node size, vertical, and geography. The report provides detailed information regarding the major factors influencing the growth of this market. The research methodology used to estimate and forecast this market begins with capturing data on key vendor revenue through secondary research such as IEEE journals, The Science Direct, NASA, and the newsletters from the leading players. The vendor offerings have also been taken into consideration to determine the market segmentation. 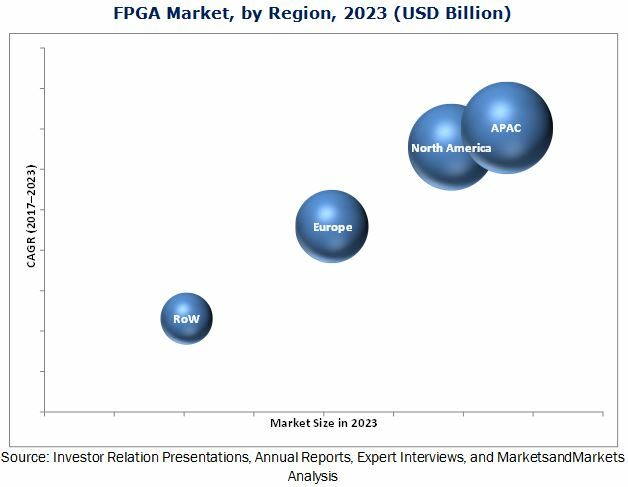 The bottom-up procedure has been employed to arrive at the overall size of the global FPGA market from the revenue of key players. After arriving at the overall market size, the total market has been split into several segments and subsegments, which have then been verified through primary research by conducting extensive interviews with the key officials such as CEOs, VPs, directors, and executives of the companies in the FPGA industry. The market breakdown and data triangulation procedures have been employed to complete the overall market engineering process and to arrive at the exact statistics for all segments and subsegments. The breakdown of the profiles of primaries has been depicted in the following figure. The FPGA ecosystem comprises manufacturers, system integrators, and distributors. The players involved in the development of FPGA include Xilinx (US), Intel (US), Lattice Semiconductor (US), Microsemi (US), and QuickLogic (US), TSMC (Taiwan), Microchip Technology (US), United Microelectronics (Taiwan), GLOBALFOUNDRIES (US), Achronix (US), and S2C Inc. (US). This research report categorizes the global FPGA market on the basis of technology, configuration, node size, vertical, and geography. The FPGA market is expected to be valued at 5.83 Billion in 2017 and is projected to reach USD 9.50 Billion by 2023, at a CAGR of 8.5% between 2017 and 2023. The growth of this market is propelled by the growth of IoT and reduction in time-to-market. Telecommunications held the largest size of the FPGA market in 2016. This vertical contributes significantly to the economy of most of the countries and includes both wired and wireless communications; 3G, 4G LTE, and 5G services are widely adopted across the world, mostly in North America and APAC. Moreover, the number of internet users has increased even in the rural areas. The automotive vertical held the second-largest market share in 2016. The market for low-end FPGAs dominated in 2016 owing to its low cost and several measures were taken up by some of the competitors to integrate these FPGAs with high-performance capabilities. The low-end FPGAs are used in automotive, consumer, display, industrial, military, video and image processing, and wireless application areas. SRAM-based FPGAs dominated the FPGA market in 2016. SRAM-based FPGAs can be developed via the latest technology nodes that require less cost per transistor and more transistors per wafer. SRAM-based FPGAs are reconfigurable, therefore new designs and ideas can be implemented readily. No extra processing steps are required as SRAM cells are manufactured using the same CMOS technology as the rest of the device. These advantages are expected to drive the market for SRAM-based FPGAs. APAC dominated the overall FPGA market in 2016. APAC is one of the largest manufacturing hubs in the world for the automobiles, and the growing integration of FPGAs in automobile applications is likely to boost the market in this region. The lack of standardized verification techniques is one of the major challenges witnessed by the FPGA market. The existing verification techniques, such as constrained-random and coverage-driven simulation, formal property checking and assertion-based verification were introduced 15 years ago. As the FPGA technology has become technologically efficient in terms of size, performance, and power, there is a need for superior verification techniques. However, a new verification process suitable for such advancements has not yet emerged in the market. Therefore, the process of reducing the development cycle of FPGAs increased the demand for better verification techniques. Market players such as Xilinx (US), Intel (US), Lattice Semiconductor (US), Microsemi (US), and QuickLogic (US) are focusing on product launches and developments, mergers, acquisitions, and collaborations to enhance their product offerings and expand their business.